The actor Nakajima Mihoemon I held this name from the 11th lunar month of 1713 to the 3rd lunar month of 1762. The actor Nakajima Mihoemon II held this name from the 11th lunar month of 1762 to the 12th lunar month of 1782. The actor Nakajima Mihoemon III held this name from November to the 12th lunar month of 1783. Born in Edo in 1779. Son of Nakajima Mihozô II, his first stage name was Nakajima Fujimatsu. He was still a child actor when his father died and he took the name of Nakajima Mihozô III in the 11th lunar month of 1784, performing at the Nakamuraza in the kaomise drama "Ôakinai Hiru-ga-Kojima". He settled in Ôsaka in 1793, performing in miyaji shibai or hama shibai, and he became jitsuaku at the beginning of the Bunsei era. He took the name of Nakajima Mihoemon IV in Ôsaka in 1820, while his son took the name of Nakajima Mihozô IV. They went back to Edo together in the 6th lunar month of 1820 and they performed in the 8th lunar month of 1820 at the Tamagawaza, where Mihoemon successfully played the roles of Fujiwara no Shihei, Shiratayû, Haji no Hyôe and Shundô Genba in the drama "Sugawara Denju Tenarai Kagami". He made his last stage appearance in the 7th lunar month of 1822, playing at the Kawarasakiza 3 roles in the drama "Reigen Kameyama Hoko". He died in Edo the 13th of the 11th lunar month of 1822. Born in Ôsaka in 1798. Son of Nakajima Mihozô III, his first stage name was Nakajima Toyokichi. 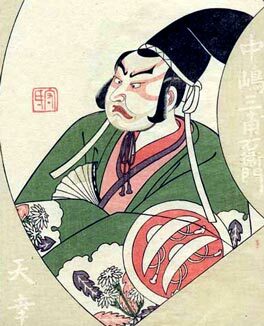 He started his career in Ôsaka as a koyaku and took the name of Nakajima Mihozô IV at the beginning of 1820. He went with his father to Edo in the 6th lunar month of 1820 and stayed there up to the death of his father the 13th of the 11th lunar month of 1822. He went back to Kamigata and took the name of Nakajima Bajû at an unknown date. 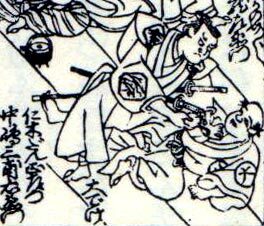 He became jitsuaku and took the name of Ichikawa Bajû in 1831. He joined a traveling troupe and received the patronage of Nakamura Tomijûrô II, who helped him taking the name of Nakajima Mihoemon V in 1847. He spent his latter years in Kyôto, performing as a katakiyaku. He died in Kyôto the 24th of the 5th lunar month of 1861. Born in Tôkyô the 17th of March 1901 in the district of Kanda. His father was a sake dealer and his real name was Suzuki Shinsuke. He was fond of theater from his teens and studied it under the patronage of the playwright Kawajiri Seitan. He became actor in 1934 and joined the experimental troupe led by Bandô Minosuke VI, who allowed him to take the name of Nakajima Mihoemon VI. He went on tour in Korea and Manchuria in 1939 and stopped acting when he went back to Tôkyô the same year. He went to the dolls business.